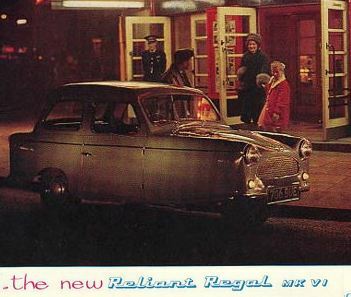 Reliant Sabre was launched in March for export only as the 'Sabra'. 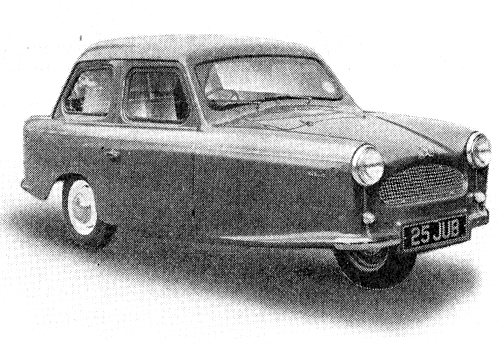 Billed as the Company's second four-wheel model (the first being the Sussita, built by Autocars Ltd of Haifa, Israel, in 1958) it features an unusual fibreglass body based on an Ashley, on a conventional steel LMB chassis and a Ford Consul, four-cylinder, 1703-cc, ohv engine which develops 73 bhp at 4400 rpm, giving 90 mph top speed. Front suspension is by leading arms and coil springs, and rear is by coil springs on live axle with Watts linkage location. Disc brakes up front. 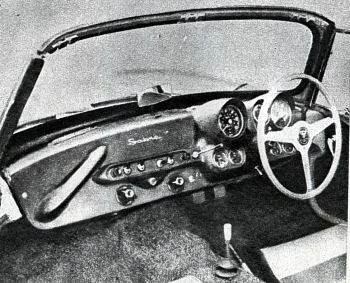 The coachbuilt body, which is available with a soft-top or detachable hard-top, has a drooping snout and an oval mesh radiator grille, protected by massive overriders. 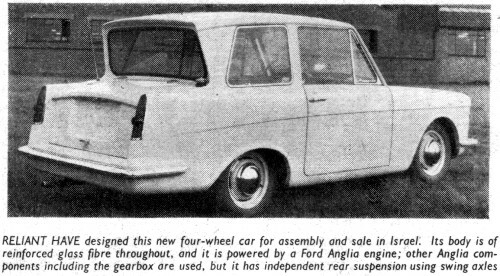 Wire wheels are optionally available.